Are you going to get ready for a bridal photoshoot? Then, we guess your gorgeous engagement ring is gleaming on your fingers. It’s time to show the world how goddess-like a bride you look forever. The album is literally going to be there forever, so rock your bridal photoshoot with our tips from experienced brides. How to Rock your Bridal Photoshoot? The next big thing after your wedding day is your bridal photoshoot because this is how you’re going to look to the future you. If this is your first time, let our experienced brides guide you through it. Just scroll through while taking your own private list of things you need to look out for, from our list below. First thing first, you will be snapped in your dressing room. Even if you agree not to, the photographer will make you the light. You need a good dressing room because you need to get ready in peace and calmth. That’s your first priority. When the photographer says it’s set, then hold your pose and try not to move, unless it’s a video shot. You need to look sharp and clear in photos and one thing that’s going to help you is the art of taking a breath and holding it in. Release it softly while holding your pose! 3. Do you have enough time? 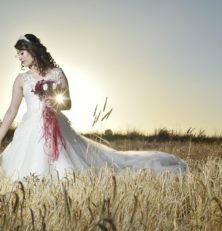 Most brides sweat through their bridal photoshoot because they did not assess the time needed for makeup + photoshoot! How many hours do you have for the makeup? Have you cross-checked with your photographer? A good question to ask is- Are you calm? If you’re not, you need time. It could ruin your peace or makeup too! If you’re photoshoot is outdoors and before wedding, you need to protect your dress. Get a white sheet that matches the shade of your wedding dress so the photographer can tuck it underneath to protect the dress the train too! Don’t forget to pose with your engagement ring. It’s a great ring and you want as many pictures with the ring in focus and you in the backdrop. Use other props to complement your poses with the ring. If you found a great dressing room for the bridal photoshoot, you might see a Hollywood mirror inside. For any reason you don’t, get a mirror and light it up with bulbs along the border. Capture the reflection and your radiance in the pictures with the mirror. You can even write on the mirror to give it an edgy or cool look. Besides the flower décor already in place, you can also play with flowers. Get the best looking flowers, a diverse set of flowers you like. Now hold it against your face or do quirky things like ‘wear it or smile at it’ to make photogenic expressions for your bridal photoshoot. Do you know which hour makes you look the best in photos? The evening time between 4 to 6. This is called the golden hour to the photographers. You can pose graciously and look like a diva in every picture if you book the photoshoot outdoors at this hour. 9. What’s your Best Pose in the Dress? Have you looked at yourself in the mirror? If you have, you must’ve figured out the best pose too. One ain’t enough, practice a bunch that makes you look gorgeous. To do this, you need your BFF to guide you. In any case, get it ready before the bridal photoshoot so that you don’t sweat too much. You’ve got bridesmaids right? Because without a helper, your photoshoot will not work out. While it’s a family member for most, bridesmaids will be more fun and effortless. Call your bridesmaids for the bridal photoshoot and give them an after-party too! We told about posing with the dress. Without putting on the wedding dress, you can still practice emotions and poses you can put forth during the photoshoot. It is always to jolt down a few flashes or memories that make you happy or ease-into-those expressions. Apart from the all the above, try to show momentary emotions that can be captured. Don’t go overboard. Be you! That being said, it’s hard to keep your composure as a bride if you have a thousand things going in your head. Don’t worry, share your worries in the comments below and our experienced brides will help you out!